Summer time is the best chance to get your kids outside doing stuff. We have recently implemented a family outside time a few times a week. We have limited TV and game time in addition to the new outings. I have been working with the kids on stuff like soccer, plain old catch, and weight lifting. I do want to keep it fun for them though so it doesn’t feel like regular old exercise. The folks over at Zing Toys sent me a couple of items to help me out with my task. They sent me a Z-Curve Bow & Zing-Shot Launcher. They are the ideal toys to get the kiddos up and active in the backyard and we have even taken them to the track lately to really let them fly far. 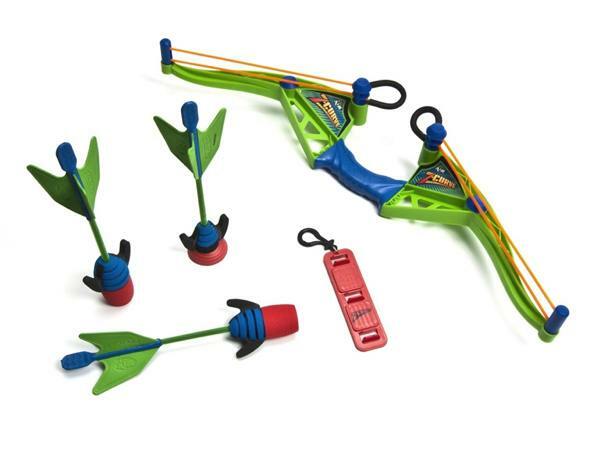 Kids can pretend they’re a modern-day, sharp-shooting Robin Hood with the Z-Curve Bow, the ultimate foam bow & arrow combo for indoor and outdoor entertainment. Hook the arrow into the loading zone through the patented loops system, pull back, then it’s Ready…Aim …Fire! 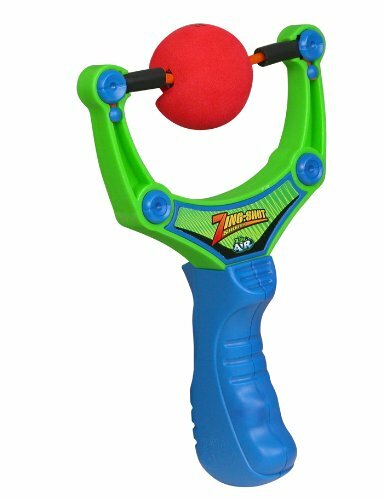 Kids can work on becoming a master marksman by loading up their choice of a stick-anywhere ZARTZ® SOFTEK™ foam arrow for high-tech archery and target practice, or a long-range Red-X ammo soft-foam arrow for bounce-back action! Ryan’s Rating: 6 out of 10!! Pros: Fun and safe. Kids loved them and pretended to be archers for hours when I first opened them. Cons: The kiddos did have a problem getting the arrows and foam balls in the weapons quickly and I wish there was an easy way to purchase extra ammo. When I was growing up and I was taken to a department store I knew that I had to be on my best behaviour. I new that if I was the shining example of good manners, obeying, and not throwing fits in public I would be awarded the most coveted prize in all of childhood…the “outing reward”. I would usually choose between He-Man, GI Joe, and Transformers. M.A.S.K., Thundercats, and Hot Wheels were my next choices. The toy line that I wanted the most of was The Transformers. It came a time though where I started seeing characters right after the theatrical movie came out that I didn’t really recognize. These dudes weren’t on the TV show that I was watching. I had no back stories and couldn’t even tell you anything about them. Little did I know that twenty-four years later my questions would be answered. On July 5th Transformers: The Japanese Collection- Headmasters came out and added something that most people in the U.S. have not had before…a continuation from the original “G1” series that answers a ton of questions. IF you are a serious die-hard lover of ALL things Transformers then you probably may want to catch Shout! Factory’s latest release from the Transformers Universe. Beware that the entire set is dubbed in Japanese. There are however English subs so you can read along if you are like me and don’t know Japanese. 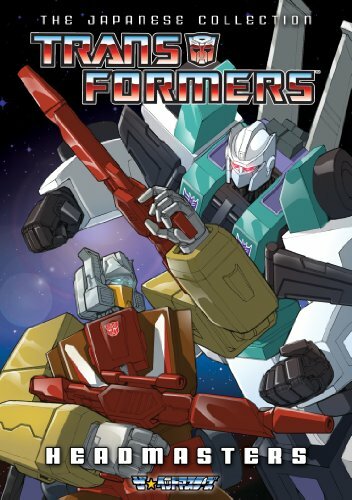 The Transformers – Headmasters is the first part of the rare Japanese trilogy that followed the popular “Generation 1” animated series. Available for the first time in North America, this collectible 4-DVD set features the complete action-packed episodes from the Headmasters series and contains the original Japanese language tracks along with updated English subtitles, a rare art gallery and more! It is very important if you or your kids are going to watch this to know that Season 4 may have marked the end of the American series of Transformers (G1), but Japan had many more stories to tell! Transformers: Headmasters replaces the G1 4th season and begins one year after the end of Season 3. Optimus Prime lives again, the energy of the Matrix has been released, and peace reigns on Cybertron… but all that is about to change with the startling arrival of the newest breed of Transformers warrior – the Headmasters! Ryan’s Rating: 9 out of 10!! Pros: Forget about the kiddos for a second. This completes a part of my childhood! Cons: The kiddos do like it but they keep asking why they are speaking Spanish. Walt Disney’s Prom pulls all the right strings for a perfect teen movie. I think they do a better job then the teen movies I saw as a kid. The teen movies of my generation was on the bleeding edge of adult humor. Prom pulls far from raunchy jokes that I remember and centers more on teen angst, drama, awkwardness and fear of the future. There is no sexual undertones but a lot of romance that leads to extended kissing but nothing that feels like the audience is invading a private moment. Another flag for some parents may be a fight the character Jesse (Thomas McDonell) gets into. I loved the humor played out in this movie. The awkward moments some of the comedic actors must endure is priceless. In one scene, Llyod (Nicholas Braun), who keeps getting turned down by every girl he asks, leaves a note on a girls locker asking her to prom. He, unfortunately, cuts out the letters from a magazine for his note and frightens the girl into thinking she’s being stalked. Fail. I think my daughter loved the romantic story lines the best. Yes, story lines. The movie follows three major love stories plus many other romantic sub plots. It is a movie about prom and prom is very romantic. I have to say she ate it up. Honestly, some of my heart strings were tugged and I got a little misty. I didn’t fall apart. I kept it, manly. It is a great film for teens and preteens. Adults in the audience will enjoy it too. Plenty of laughs and some tears (except me. I didn’t cry once) and my daughter and I both liked it. Check it out. Wednesday night, I get to go with my oldest daughter, Abigail, to a screening of Prom from Walt Disney Pictures. This film looks like it was made for my daughter and from the trailers, I think I going to like it too. It has all the elements that make a teen movie work and should be fun. From what I’ve heard the soundtrack is pretty cool too. I’ll let you know what we think this Friday when it’s released. Who are you going to take to Prom? At “Prom,” every couple has a story and no two are exactly alike. Several intersecting stories unfold at one high school as the big dance approaches; “Prom” portrays the precarious passage from high school to independence as some relationships unravel and others ignite. For Nova Prescott (Aimee Teegarden), it’s a battle of wills as she finds herself drawn to the guy (Thomas McDonell) who gets in the way of her perfect prom. Fellow seniors Mei (Yin Chang) and Tyler (De’Vaughn Nixon) harbor secrets, while others face all the insecurity and anticipation that surrounds one of high school’s most seminal events. There are hundreds of nights in high school, but there’s only one “Prom.” Featuring an emerging ensemble cast and a powerful soundtrack, “Prom” hits theaters April 29, 2011. Here is something for that geek that you have on your list that your not sure what to get them. I have read the entire run of the series in trade paperback form and seeing the pages of the story that I read come to life is really gnarly. Remaining true to the heritage of panel-by-panel graphic storytelling, boasting groundbreaking graphics, sensational soundscapes and, of course, the explosiveness of the Mighty Marvel Universe, here comes the all-new, all-awesome Marvel Knights animation series. Dream-team creators Joss Whedon (TV’s Buffy the Vampire Slayer) and John Cassaday (Planetary, Captain America) present the explosive, all-new flagship X-Men series – marking a return to classic greatness and the beginning of a brand-new era for the X-Men! Cyclops and Emma Frost re-form the X-Men with the express purpose of “astonishing” the world. But when breaking news regarding the mutant gene unexpectedly hits the airwaves, will it derail their new plans before they even get started? As demand for the “mutant cure” reaches near-riot levels, the X-Men go head-to-head with the enigmatic Ord, with an unexpected ally – and some unexpected adversaries – tipping the scales! 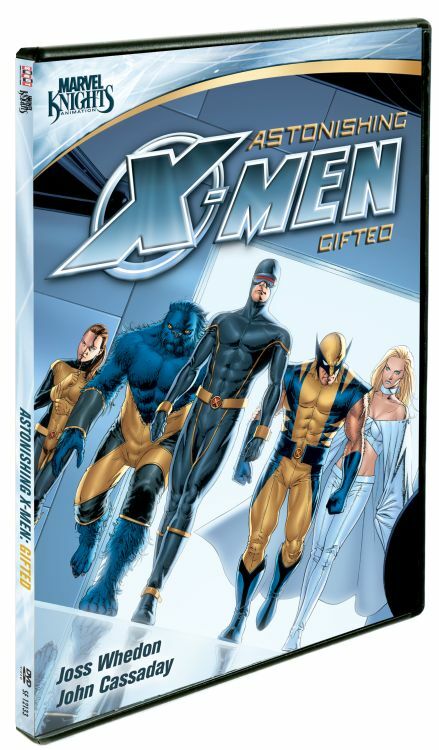 Gifted is the first 6 episodes of the Astonishing X-Men – Gifted 3-part series and you can snag Astonishing X-Men – Gifted for the holidays! Ryan’s Rating: 7 out of 10!! Pros: Easy access and good introductory way to introduce someone to the comic realm. Cons: You gotta wait for the continuation of the story arc. Back in the day there was a game that took families by storm. It brought them together, got them a little frightened, and made them want more. I did not have the honor of playing this game in my youth because I came from a family that never even thought about having a game system in the house until I asked for one. Atari’s Haunted House became an instant classic when it hit the market in the 80’s. 30 years later, those kids are moms and dads, and able to share this classic game with the new generation of gamers they are raising. 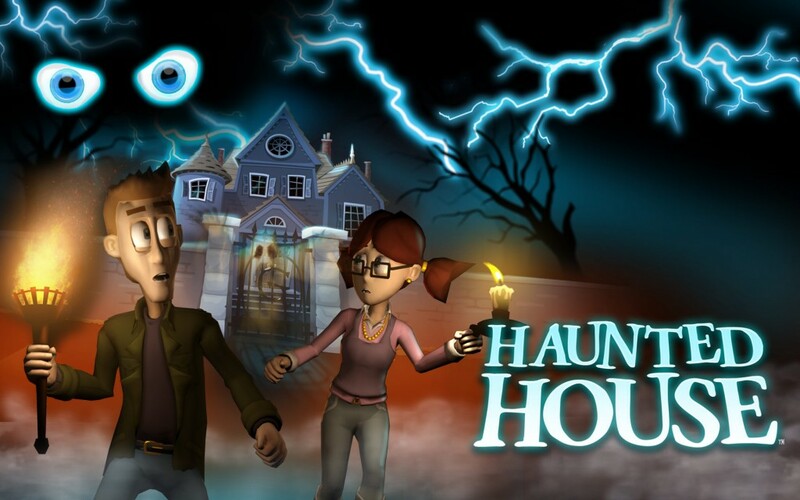 Atari has given Haunted House a modern game-play update mixed with the proven fun factor and suspense of the original blockbuster game, and is now a new game for the Wii, Xbox Live and PC download. Jump into fast-paced action as you explore new environments and discover hidden secrets – but beware – danger lurks behind every corner! You’ll have to combat rats and bats, ghosts and gargoyles to survive the Haunted House and solve its mystery. 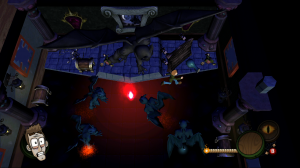 Use powerful light sources to defeat enemies and reveal secret doors and hidden treasure. This classic game has been remade for a new generation authentic replication of arcade gameplay, rich 3D environments, interactive objects, dynamic story-lines, and new characters. Haunted House empowers the user as the grandchild of the main character who got lost in the original game looking for the magical Urn 30 years ago. The user must navigate their way through new spooky environments, enemies with enhanced game play and new items regarding their grandfather’s whereabouts. Atari’s classic groundbreaking game is back with more chills, cool new unlock-ables and plenty of scary new enemies! Over thirty years have passed since your grandfather, Samuel Silverspring, disappeared without a trace. When a mysterious letter arrives claiming to have insight on your grandfather’s whereabouts, you are led back to the place he was last seen, Graves Mansion. As you dare to embark on this spooky adventure to uncover the truth about your grandfather, you are forced to face your fears in the dark depths of the Haunted House? Pros: Fun, refreshing, and very fluid game-play that kept the kiddos staring at the screen. Cons: I just wish the original was included as an extra bonus from the main menu. Most of you know I like video games. My whole family likes video games. One thing that most all of us have had happen is we have gotten a video game theme stuck in our heads. Like singing at the top of your lungs something from Guitar Hero, humming the World of Warcraft theme or whistling the Super Mario theme. Some of the biggest earworms ever. I you want to experience a whole lot of video music and themes in ways that you may not have thought before then check out Video Games Live: Level 2. 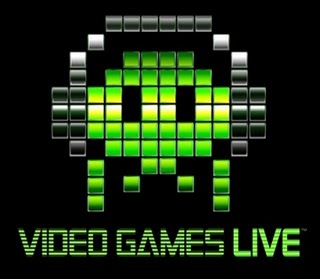 Featuring music from the greatest video games of all time as performed by top orchestras and choirs from around the world, Video Games Live: Level 2 features the Louisiana Philharmonic Orchestra performing along with exclusive video footage and music arrangements, synchronized lighting, special fx, solo performers, percussionists, live action and unique interactive segments, creating a entirely unique entertainment experience. 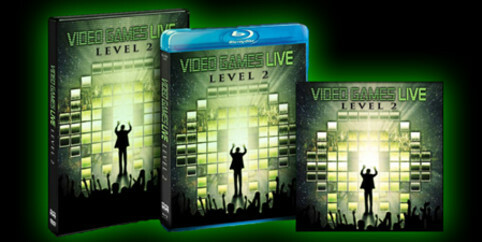 Created and produced by world famous video game composer Tommy Tallarico, the Video Games Live: Level 2 CD features 16 musical performances (2 additional tracks on the download version), and the DVD and Blu-Ray include never-before-televised music and video from Super Mario Bros., The Legend of Zelda, Sonic the Hedgehog, Halo, Warcraft, Chrono Cross, Castlevania, Guitar Hero, God of War and many more, as well as a special Classic Arcade Medley featuring games from Pong to Dragon’s Lair and Tetris, and more than three hours of bonus material. Filmed in New Orleans this past April in high definition with 5.1 audio surround sound, the concert features the Louisiana Philharmonic Orchestra, a 34-person chorus; a number of soloists including pianist Martin Leung, flautist Laura “Flute Link” Intravia, original vocalists from the games; plus a rock band featuring Tallarico on guitar, lasers and special effects. I know this is not an official trailer of the show but this is just a sample of what you will find on the disc! I love this dude! Pros: Most of the songs you will know and love. Cons: Not for someone who doesn’t care about video games or music…pretty much what the whole disc is. What holiday season would not be complete without super heroes? I would rather not think about it. 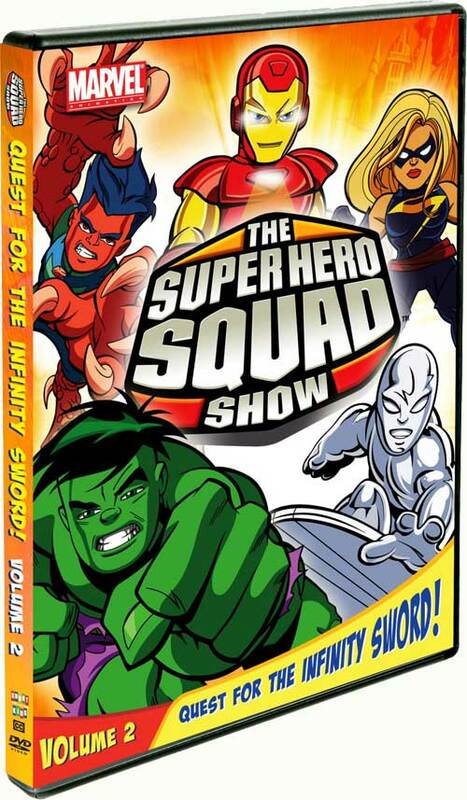 Since the holiday season is approaching, I feel that it is only right to mention that The Super Hero Squad Show Volume 2 would be a great addition to your child’s collection. The way these characters interact with each other in a way that promotes teamwork, trust, and standing for what is right is always a great way to arouse these traits in our children. Watch as Iron Man, Wolverine, Hulk, Silver Surfer, Thor, Falcon and their friends faithfully – and hysterically – protect Super Hero City from the wild, weird and even wacky villainy of VillainVille’s most infamous baddies, led by the sinister Dr. Doom! The Super Hero Squad Show: Quest For The Infinity Sword! Volume 2 DVD features the second six episodes from Season One, plus all-new bonus features, including an interview with Tom Kenny (Iron Man, Captain America and MODOK), hero profiles, trailers and more. Boasting a stellar ensemble of well-known celebrity voice talent, The Super Hero Squad Show animated series features super-stylized, action-packed versions of Marvel’s popular characters (including Iron Man, Thor, Captain America, Hulk, Silver Surfer and Wolverine) with a comedic twist. 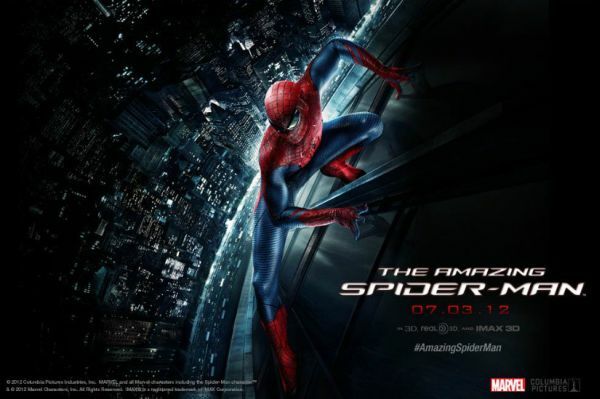 Marvel has attracted top voice talent to play the roles of Marvel’s iconic heroes and villains. Not to mention, Volume 2 of The Super Hero Squad Show also boasts the voice talent of Kevin Michael Richardson (Family Guy), Greg Grunberg (Heroes), Wayne Knight (Seinfeld), Ray Stevenson (Punisher: War Zone) and Lena Headey (Terminator: The Sarah Connor Chronicles). From The Atom … It Rises! If This Be My Thanos! Deadly Is Black Widow’s Bite! Ryan’s Rating: 8 out of 10!! Pros: Kids love it, very family friendly, and extremely iconic characters. Cons: Still this dang theme song will get so stuck in your head! 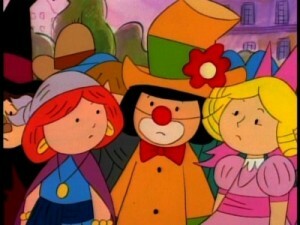 I am a sucker for characters that have holiday specials or episodes that center solely around certain events. So, when I was contacted by Shout! Factory to check out Madeline’s Halloween And Other Spooky Tales I got all giddy in anticipation of carving pumpkins, roasting pumpkins seeds, and watching Halloween themed animated adventures. Inspired by the beloved classic books that introduced us to a delightful 8-year-old girl who lives at a French boarding school run by nun Miss Clavel, who live in an old house in Paris covered with vines, Madeline’s Halloween & Other Spooky Tales is full of spirited seasonal fun. This collection contains five spooky animated episodes, all making their DVD debut: Madeline’s Halloween; Madeline and the Mean, Nasty Horrible Hats; Madeline and the Mummy; Madeline and the Haunted Castle; and Madeline and the Spider Lady. I have always loved Halloween. We treat it as a night that is fun-filled, imaginative, and memorable. This DVD is a great way to get your kids in the mood for trick-or-treating and make childhood memories…..or if you are an adult regret eating all of that candy and the chance to scare the crap out of little kids! Pros: Kids love it, very young child centered, shows Halloween as positive experience. 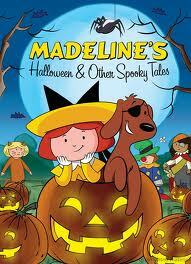 You can get your copy of Madeline’s Halloween And Other Spooky Tales just in time for Halloween!